HTC Vive vs PlayStation VR- Which one is better? HTC Vive is one of the top players in the VR industry and has been one of the best VR headsets when it comes to giving immersive experiences. The PlayStation VR came way ahead of the time when the HTC Vive was released. The time HTC Vive consumer version was out, the PlayStation VR was still named as the Project Morpheus. Basically, there is a lot of time gap between the two releases and a lot of differences between them as well. Like the Oculus Rift, the HTC Vive is a PC based VR headset and would need powerful PC specs to run it smoothly. The PlayStation VR is a console based VR headset which means it runs on the PS4 or the PS4 Pro. Without wasting much time let’s look at the differences between each one of these headsets. The design of the Vive and the PlayStation VR is completely different. 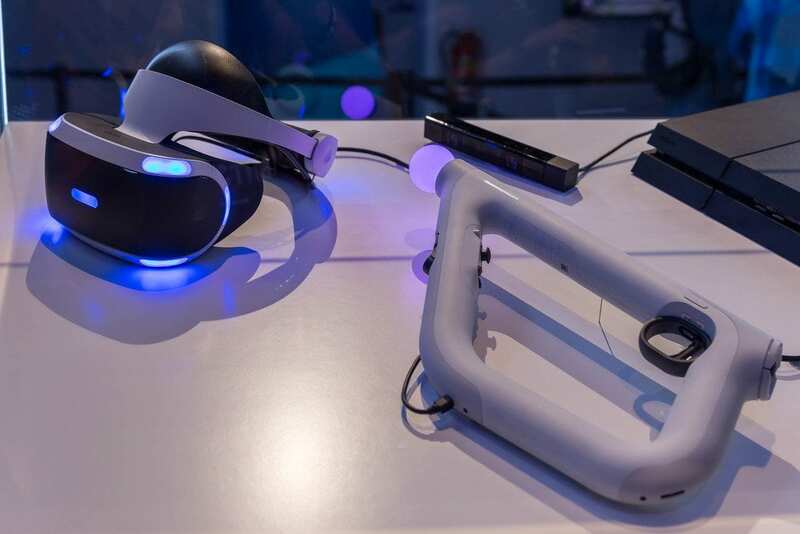 The Vive is all black and comes with two controllers while the PlayStation VR is a mix of black and white. No doubt the design of the PlayStation VR is slightly attractive when compared to the HTC Vive. Sony did put some effort while designing their VR headset because it does look amazing especially with the blue LED lights on the front and the back of the VR headset. Comfort usually does not matter for a 10-minute gaming session but if you are planning to sit for really long hours wearing the VR headset then you should consider that the Vive makes you sweat relatively more in comparison to the PlayStation VR. Both are comfortable when it comes to their design where the PlayStation VR has a strap that goes all around the head and holds the headset firmly in place. The PlayStation VR design is much more elegant in comparison to the Vive. The Vive, on the other hand, has a three-way strap which distributes the weight equally on the face of the person wearing it. The PlayStation VR weighs 610 grams while the HTC Vive weighs 470 grams. So the Vive might look a little heavy but in reality, it is way lighter than the PlayStation VR. Do you feel the weight while gaming? Yes, you do but after around 2-3 hours of continuous gameplay, you might want to take it off for a while and relax. The weight of the Vive is the same as that of the Oculus Rift, so I guess both the PC VR headsets are lighter in comparison to the PSVR. 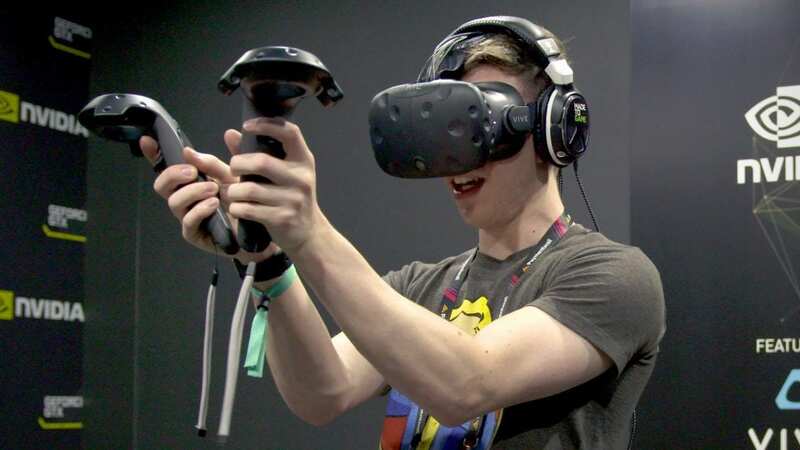 The HTC Vive has a resolution of 2160 x 1200 and contains an OLED display, the PlayStation VR, on the other hand, has a 5.7 inch 1920 x 1080 OLED display with RGB subpixels which gives a much more smoother experience in VR. These VR headsets have a pretty good display but you can definitely feel that the Vive is slightly better than the PlayStation VR on this feature. So, if the PlayStation VR has a better design, the Vive definitely is lighter and has a better display resolution giving you an immersive VR experience. The refresh rate for the HTC Vive is 90 Hz and that of the PlayStation VR is 120 Hz. The PlayStation VR does have a much better refresh rate but the refresh rate in the Vive is not that bad either. You really would not feel a major difference while gaming most of the titles especially the ones that are light on the graphics. The same differences with the refresh rates were there between the Oculus Rift and the PlayStation VR as well and the same opinion went down in that case where you really do not see a huge difference, however, it is always better to have higher refresh rates to have a smoother gaming experience. Lag in VR world can really be a major spoiler and you do not want to end up having that problem with any of your VR headsets. The field of view which is another important aspect in a VR headset and determines how immersive your experience can get. The HTC Vive has a field of view of 110 degrees while the PlayStation VR has a field of view of 100 degrees. The larger the FOV, the better is the VR experience and in this case, the HTC Vive is for the win. Field of View is really important to have a better taste of Virtual Reality so even if the PlayStation VR falls short by 10 degrees it is still not bad with better refresh rates. Considering both the features, the Vive does well with the FOV and the PlayStation VR has better refresh rates. While making a purchase you need to decide which one is better and which feature is more important to you for me an overall win would go with the HTC Vive but again if you are a console gamer then the PlayStation VR is not at all bad option and you can definitely go for it. Coming to positional tracking, the HTC Vive comes with room-scale tracking and it does it accurately with the help of the sensors mounted on the headset and the lighthouses that detect the position of these sensors. The Vive has an amazingly accurate tracking and the VR headset is definitely worth every penny you spend on it and even more. The Positional tracking is very accurate and with the two controllers, you can even interact with the objects present in the Virtual world. It is amazing and HTC Vive was the first VR headset that was launched with the controllers. 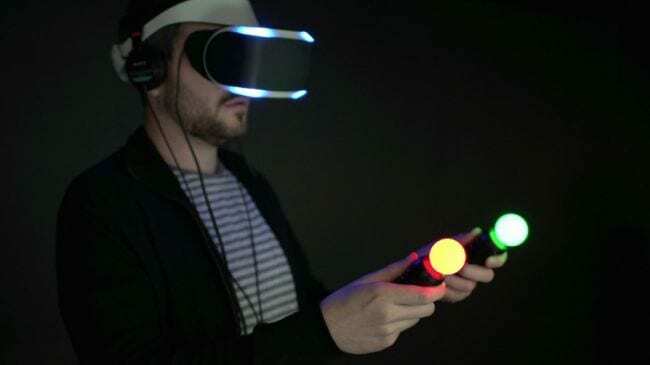 The Oculus Rift released its touch controllers months after the HTC Vive did and the PlayStation VR headset released around the time Oculus Rift released its touch controllers, LOL. The positional tracking is obviously better with the HTC Vive and I can tell that even before explaining to you about the features of the positional tracking in the PSVR. There is a reason that you are paying that moolah for the HTC Vive and you realize why once you actually compare it to any VR headset out there(VIVE is amazing!). The PlayStation VR comes with a PlayStation Camera that would be used for positional tracking. The head movements would be tracked with the help of this camera and you have the Move controllers that would help you have a more immersive experience by letting you interact with the objects in the VR world. The Move Controller will be tracked by the PlayStation camera as well. You get a bundle of the PlayStation VR, Move controllers and the PlayStation Camera which means that the bundle is all you need to get started with a PlayStation VR headset. Oh yes, another important thing that you need is a PS4/ PS4 pro. Bottom line, the touch controllers are amazing and nothing can beat the touch the touch controllers that come along with the HTC Vive. The PlayStation VR is compatible with the PS4 console and the PS4 pro. This VR headset is a console based VR headset hence all you need to get started with the PlayStation VR is the PS4 Console. Nvidia GTX 970 / AMD Radeon R9 290 graphics card or later. The graphics requirements may drop down after the release of eye-tracking peripherals by the HTC Vive which would be released later this year. Now, more laptops and PC’s are affordable and they are VR ready. You can easily get a VR ready laptop with a budget of around $1000. 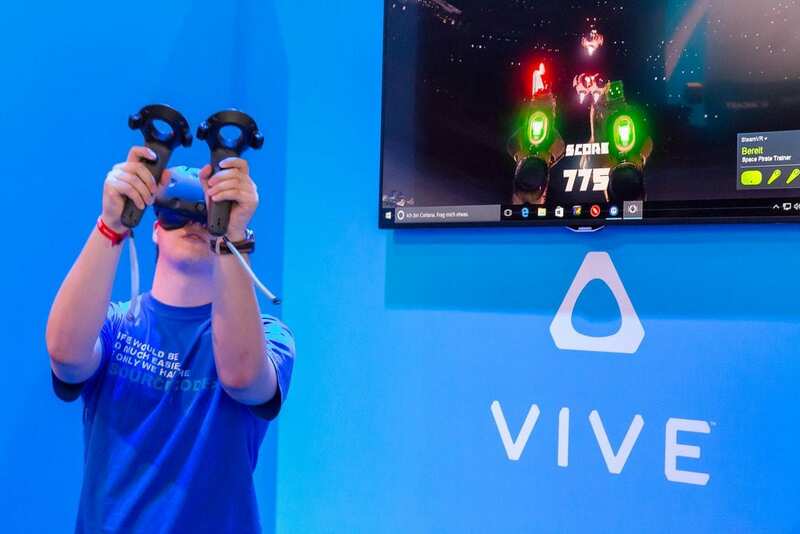 The Vive was the first VR headset to release and it has been quite some time since its release and there are a ton of VR games that are compatible with the HTC Vive. The games are amazing on the Vive and the list is never-ending. If you have a new Vive then you would be busy checking out each and every game and trust me you are never going to exhaust their collection. The PlayStation VR has impressive gameplay and the best part about the two VR headsets is that they have slightly different titles. The Vive and the Oculus Rift pretty much end up with having the same titles(not exactly the same but most of them) but you do find a few different titles in the PlayStation VR and that is interesting. The Vive, on the other hand, was released earlier than the PlayStation VR and is brimming with various titles that are for both PC and the Rift. The Oculus Rift definitely has more titles and games to own in comparison with the PlayStation VR. Although the PlayStation VR is trying to keep up with new titles like the Farpoint and ROM: Extraction, there would be a lot of catching up to do. Final conclusion would be that there are plenty of titles supporting both the VR headsets with obviously the Oculus Rift taking the lead in this case. There is a lot to browse from and there are plenty of games that keep releasing all the time so there is really nothing much to worry even if you have the PlayStation VR. The HTC Vive costs $799 and includes the touch controllers, VR headset, and sensors, basically everything that you need to get started with gaming on the Vive. The vive is the most expensive VR headset out there and it is worth it. The HTC Vive is worth every dollar and the best part about the VR headset is that they keep updating the content. HTC Vive would also be including a few accessories like the eye tracking peripheral and the audio strap which is pretty interesting and it really shows that the company is working towards expanding their VR niche. HTC Vive is one of the best VR headsets that you can choose and the best that you would get. The HTC Vive is definitely a buy especially if you have the required PC with all the specs that are needed to run this VR headset. The PlayStation VR, on the other hand, is a good VR headset especially if you have the PS4 console then you might be a little inclined towards buying this VR headset. If there was a winner then I would clearly pick the HTC Vive but if you are planning to buy a VR headset then you should really think about the system needed to run the Vive and if you are OK with making an investment in a PC/ laptop with the needed specs. The PlayStation VR bundle which contains the PlayStation VR headset, the move controllers and PlayStation Camera costs $500. The PlayStation VR is relatively less expensive than the Vive but yes, the quality of the Vive is way above in comparison to the PlayStation VR in many aspects. If you want you could check out both the VR headsets on Amazon and even check out some Amazon reviews.